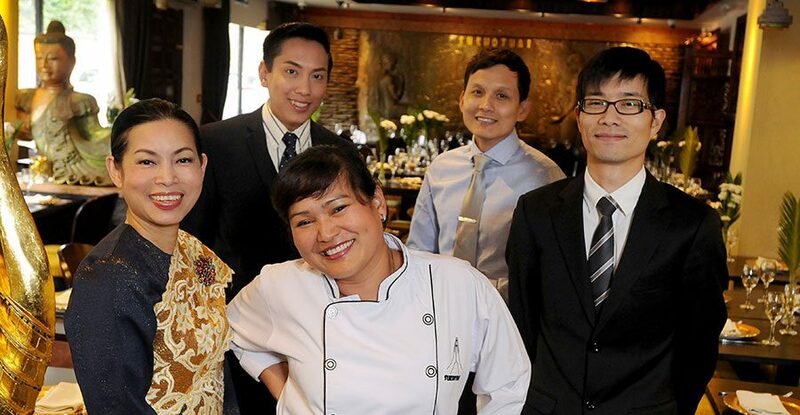 Sukhothai’s catering service is flexible and adaptable to any occasion. Our chefs will take our restaurant menu and create a selection of dishes to suit your event and tastes. For smaller private or business functions, we can make the food at our restaurants and deliver the buffet directly to your venue or business premises. Our buffet plan caters for small parties and gatherings right through to much larger functions and events, so we really are very flexible to the size of your function. Alternatively, if you are looking for somewhere to hold your special function (leaving parties, important birthdays etc), business meetings, staff away days or maybe a new product launch, you can book any of our restaurants, for your exclusive use (during the day time) and we can also offer you your very own personalised menus! For something a little bit more intimate, at Sukhothai South Parade we have have a dedicated private dining room that can seat up to 16 guests. Our private dining room has recently been used by Hollywood royalty Bill Nighy and Annette Bening. It’s a really special space that is perfect for memorable, intimate dinners, business meetings and small events. However, if you are having a large private function, like a wedding or other large event or maybe a business function, then our fully-fitted 18ft mobile kitchen can bring all the authentic flavours of Thailand to straight to your venue, serving fresh dishes throughout your event to make sure all your guests are served up a true Thai feast.